Dear friends! Unfortunately, there are no free places to the retreat in Shaolin. Registration is over. Dear friends! Because of a large number of people who wish to participate in the retreat, we stop receiving applications on the site. Those who have already filled in the application on the site (included in the preliminary list) must confirm their participation in the retreat by sending us (shaolin2017@kundawell.com) a scan of your air tickets and passport, within a month. If before April 23, 2017 we do not receive from you this confirmation, your applications will be canceled. If there are available seats, we will resume registration on the site from April 23, 2017. What is a retreat? The word “retreat” comes from the English “retreat” - a refuge, shelter, a place for solitude and self-development. The Shaolin Retreat is a unique experience of immersing yourself in a deep state of silence for students who practice meditation and practice in the Zhong Yuan Qigong system. The Shaolin Monastery is a place of power that different from any other places. For many centuries Shaolin monastery remains a place for deep meditation practice, Chan Buddhism, martial art of Gun-Fu to many great Masters and their disciples. Morning practices and meditations performed during the retreat are aimed at calming the mind, getting rid of annoying thoughts and maintaining consciousness in a quiet state. This allows you to begin researching your own inner world, which is deep, versatile and complex system. When immersed in the depths of your consciousness, you will find many beautiful, pleasant, and sometimes very difficult moments. If you continue to practice meditation, you will be able to experience a feeling that is beyond the bounds of ordinary happiness. Practice of Qigong has a positive effect on human health. It allows you to find the balance of Yin-Yang, open energy channels and remove energy blocks. As a result of practice, it is possible to say goodbye to many chronic health problems, to find peace and begin to live in harmony with oneself. Retreat can remove the harmful effects of circumstances, emotions and stress in the person. When immersed in themselves, people stop to think about worries, businesses, deeds and obligations and suddenly new and unexpected prospects of creativity open up, fresh creative ideas come up, seemingly impossible tasks are resolved, something like “enlightenment” occurs in the mind. A person feels a surge of energy, everything becomes extremely clear and understandable, tormented questions that puzzled you for a long time have been cleared and answered. We can say, that in a few weeks you get a “system reboot” - cleaning up unnecessary information and structuring the accumulated knowledge and experience in order to use them most effectively. 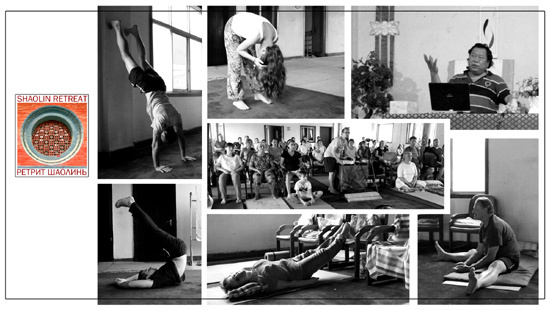 The retreat is recommended to practice at least twice a year. 1. The usual daily routine (the first and last days of retreat). Morning practice at the gates of the Shaolin monastery. 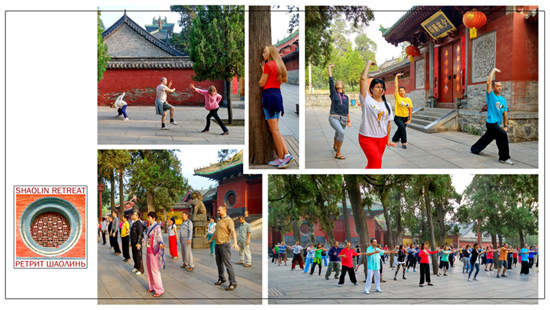 Preparation exercises, Shaolin massage, exercises to gather Qi and “Big tree”. Each day, there will be 4 lessons devoted to the theory and practice of Zhong Yuan Qigong, which last for 2-3 hours with breaks for rest and meals. Classes are held from 9 am to 10 pm. 2. Bi Gu Shi Qi schedule routine. During the practice of Bigu ShiQi, the participants of the retreat switch eating to fruits diet and as they practice, eventually refusal to eat is a result. In the process of practice, the human body is transformed and begins to work on more thin energies. If correctly practiced , you activate the special abilities of the body, which make possible to receive energy for vital activity directly from the surrounding environment. Morning practice start at the gates of the Shaolin Monastery begins at 5.30 in the morning. Perform preparation exercises, Shaolin massage, exercises for gathering Qi and “Big tree exercise “. Every day, in the morning and in the evening, there will be two 4-hour sessions devoted to the theory and practice of Zhong Yuan Qigong. Classes allow you to go deeper into a quite state. 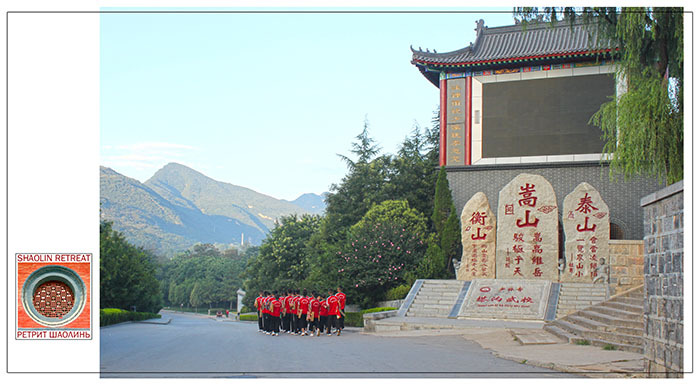 During a mid-day break, retreat participants can visit various temples and places of power in Shaolin Monastery area. 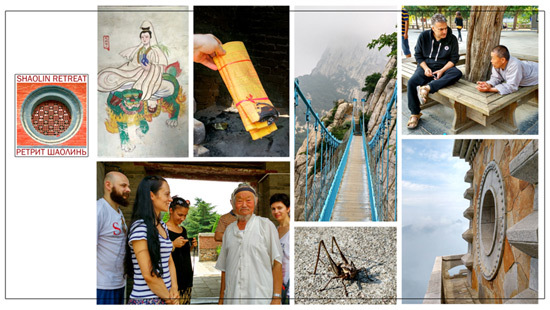 The lists of places you should visit are sent to each participant of the Shaolin retreat. You shell print it and bring it with you. 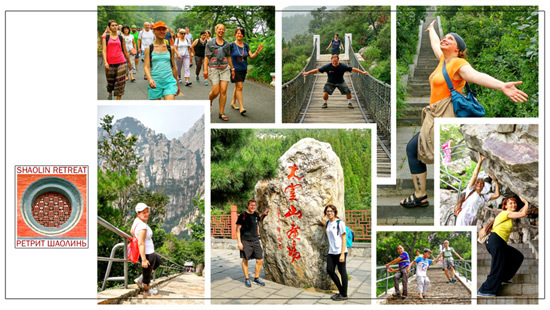 Trip to Songshan and Three Emperors mountains are planned at the beginning of the retreat. The hiking trip lasts about 6-8 hours, depending on the speed of the ascent. You need comfortable shoes, a hat from the sun, change clothes with a short sleeve shirt and a duster coat or windbreaker. If you wish you can book an excursion to Luoyang at end of the retreat. 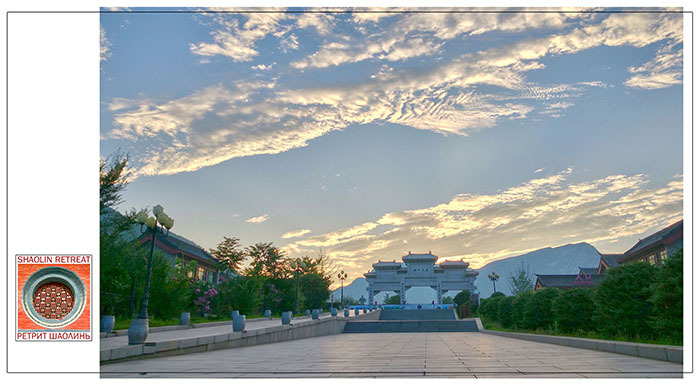 Luoyang city is 2 hours away by bus from Shaolin. During this excursion, you visit the legendary “Long Men” grottoes and White Horse Temple, where Buddhist sutras were brought from India for the first time and were translated into Chinese. There are 2,100 grottoes, tens of thousands of statues of Buddha and more than forty Buddhist pagodas as well as a large number of stone stables. Practice is conducted systematically and consistently. Master gives explanations and advice on how to solve possible problems and obstacles in meditation. Please listen and think about what you heard. Then you have an opportunity to experiment, trying everything upon yourself. Shaolin Retreat is a place where you can verify in real time what is good and right for you and what is not. Only after you have your own experience, you can with confidence accept or reject given ancient knowledge and practice. If you practice other techniques of meditation, we ask you to step back from them during the retreat. It is important not to confuse different methods and approaches. Retreat is designed to teach people the practice of Zhong Yuan Qigong, if you attend a retreat for the purpose of training another meditation or practice then this is not the right place for it. Meditation Retreat ZYQigong is a somewhat unusual event, although everyday meditation is quite normal. The large group of people should get along, connected with each other in a completely new way. Here we are united by the common experience of meditation with all of its sufferings and joys, discoveries and disappointments. During retreat our life is built around a common goal, rather than the self-interest of the modern world. To maintain harmony in group, we must agree to comply with certain conditions. Most important things to remember that this is a “quiet” retreat, you shell follow the schedule, do not use perfume or other smelling means, observe advice and remember about safety. During the retreat: Please show respect and understanding, awareness and wisdom to other participants , you get a lot of information, you can write down everything if you think is necessary for you on paper, but we ask you not to record the retreat on video. As mentioned earlier, we will hold not complicated schedule. We ask you to take part in all meditations and listen to each lecture; follow the instructions of the Master. There will be enough time to wash clothes, take shower, think and analyze your experience gained in scheduled breaks. As mentioned earlier, we will hold not complicated schedule. We ask you to take part in all meditations and listen to each lecture; follow the instructions of the Master. There will be enough time to wash clothes, take shower, think and analyze your experience gained in scheduled breaks.For comfort and convenience during meditation, please wear loose and light clothes (but not transparent). We also ask that your clothes be clean. During the retreat, there is no need to wear jewelry and other types of jewelry, be simpler and more natural. The usual schedule for breakfast, lunch and dinner offers mostly Chinese cuisine. You can choose the dishes you like as it is a buffet system. with fruits and vegetables, meat and fish. 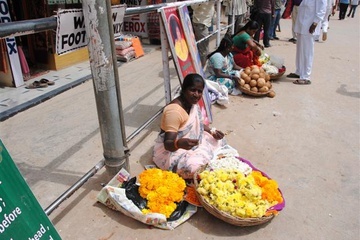 In small shops in the territory of the retreat you can buy drinks and snacks. The whole group eats at the same time. We are not able to accommodate special menu for individual with vegetarian or non-vegetarian menu request. Also there is no place to store or refrigerate food in case you bring food with you. In advance, I’m sorry for any inconvenience. 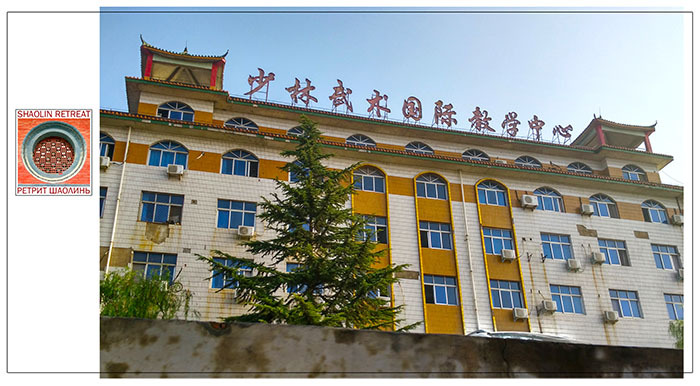 Hotel “Dharma” is offered as a primary accommodation facility which is located on the territory of the Wushu school and as part of it. Rooms are based on double occupancy for 2 people in a room with a bathroom and shower. The room has 2 beds, 2 bedside tables, clothes hanger, table, TV, 2 armchairs, stool, electric kettle and air conditioning. Living conditions are very simple. For an additional fee, you can stay in a hotel with better living conditions. Cigarettes and alcohol well known toxic substances which intoxicate the body. Cigarettes and alcohol interfere with meditation and your natural relaxation. It is necessary to refrain from smoking and drinking any alcohol for the duration of the retreat. Notes: Usually we have 2 or 3 groups retreat each year in worldwide famous Shaolin Monastery. This year, 2017, most time Grandmaster Xu Mingtang will Biguan, meditate deeply or research some project like cancer. He will give only one advanced retreat group this year and limit to 150 participants only. Last year second group we had 180 students, it was too much for the hall of retreat. Cost: 20,300 Yuan (can be paid in US Dollars or Euros, based on exchange rate as of 5th August 2017. All payment is accepted in cash at the date of arrival). Arrival to Beijing, registration of participants. Check-in time is noon. Kang Ming Hotel is next to Kundawell Institute building. 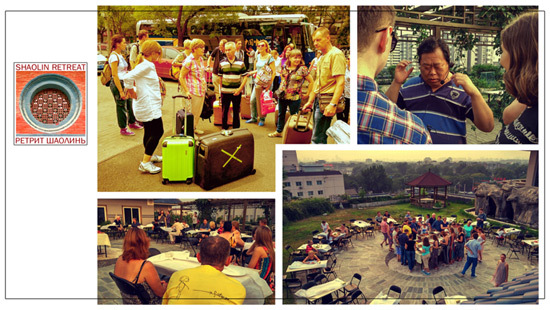 Retreat participants should arrange their own transport from the airport to the hotel (detailed information regarding Beijing taxi service will be published later). The majority of the group travels by train. You need to send the copy of your passport to our e-mail address shaolin2017@kundawell.com as soon as possible (at least one month before arrival) and present your passport (the original document) to organizers not later than 2 p.m. August 5th.We need your passport to buy the train ticket for you. Check out time from the hotel is at 9.00 a.m. Arrival at Shaolin area is planned around 4.30 p.m. 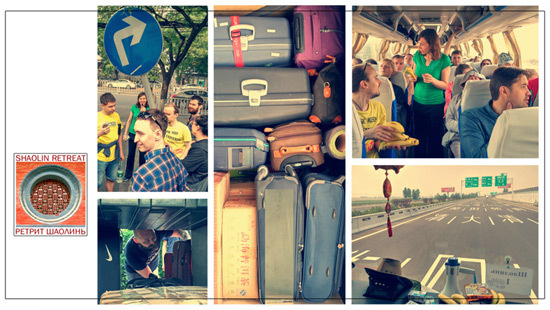 The trip by train to Zhengzhou takes about 3 hours, the bus-ride from Zhengzhou to Shaolin takes about 2 hours. We will check in and have a dinner at Shaolin around 6 o’clock. You may also fly to Zhengzhou 郑州 (cost not included in retreat price). Traveling by air costs about $100-120 US Dollars, each way. You should book your own airfare directly to Zhengzhou 郑州from your home country. The organizers can send a taxi to pick you up at the airport upon your arrival. Last year, the taxi fare from the airport in Zhengzhou to Shaolin was about 400 Yuan. If you book the recommended flights, we will organize a bus from Zhengzhou airport to take you to Shaolin. 7 - 29th August: Intensive training. Classes will start on August 7th, at 3 PM after lunch. Retreat ends on August 29th, at 6 PM. Please, note that the additional cost of the hotel can slightly change! Dharma hotel is where the majority of the group stays, and it is where the retreat lectures with Grandmaster Xu Mingtang are held. The Dharma hotel renovated rooms on the lower floors (1, 2, 3). Rooms on the upper floors (4,5,6) remain in the same condition as before. The prices of the renovated rooms are raised due to the renovation. The non-renovated rooms in Dharma Hotel do not have any extra charge. Attention! The prices for accommodation can slightly change! Please note that Hotel Dharma also has rooms with 3-and 4-beds. *Please note: We will first assign double rooms, i.e. rooms for all those wishing to share rooms with other participants. If after this there are rooms still available, we will then assign single rooms based on availability. We cannot guarantee that there will be enough rooms to fulfill all single use requests. Check out time from the hotel is 30 August, at 6.00 a.m. We will have a bus-ride to Zhengzhou train station; the entire group travels to Beijing by train. 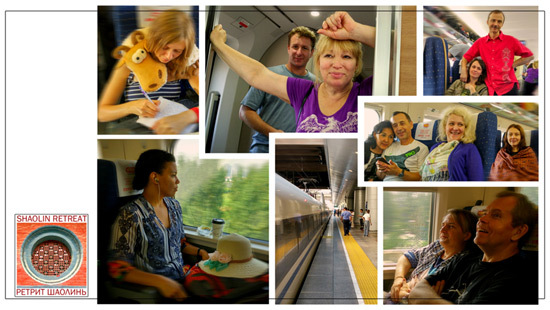 It takes 3 to 3,5 hours to get from Zhengzhou to Beijing by train. Arrival to the hotel is planned around 2 p.m. August 30. If you travel by plane, check out time from the hotel is 30 August, at 5.00 a.m. Arrival to Beijing is planned around 11.05 a.m. Flight is not really recommended because the trip by train is more convenient. With regards to flight booking we strongly recommend that you book tickets through Zheng Zhou (Zhengzhou 郑州) irrespective of the country you are travelling from. The managers will organize the bus to take you to the airport and from the airport to your hotel only if you take a flight recommended by us (please, see the information below). If not, we can send you by a taxi to Zhengzhou airport. The taxi fare to Zheng Zhou airport is about 400 Yuan. In the evening at 7:00 p.m. we will have a banquet/gala dinner to honor the completion of the retreat, including dinner at Kundawell. Free day for shopping, or visits to temples, Beijing baths complex, etc. List of attractions will be provided to each retreat participant. Please Note: If you will arrive Beijing before noon on August 5, or want to stay later than noon on September 1, you have to separately purchase accommodations at the hotel in Beijing.